192 pages | 30 B/W Illus. This book proposes a new model, the Lean and Green Business Model (L&GBM), where the environmental aspect of sustainability is integrated with Lean thinking in order to create a way of thinking that contributes to and balances the three sustainability dimensions of people, profit, and planet. The model presented uses a kaizen approach that will help readers improve mass and energy flows in manufacturing environments that already possess a deployment level in applying Lean. The Green Factory: Creating Lean and Sustainable Manufacturing tells the story of how GKN, a major British multinational corporation with operations in more than 30 countries, developed and implemented a Lean and Green Business Model in two of its automotive facilities in Brazil. It provides practical insight into how GKN was able to develop and deploy Lean and Green in a manner that resulted in environmental and cost benefits in the automotive facilities that operated in Brazil’s high-inflation environment. Detailing proven concepts and sustainable models derived from the first-hand experiences, the book supplies information against the backdrop of GKN’s automotive manufacturing environment. The authors take an inside-out approach, describing the real issues Environmental Health & Safety professionals face when implementing sustainable manufacturing policies. The book covers the corporate issues of balancing profit with environmental concern and the behavioral issues of engaging the workforce to identify and reduce environmental waste. All the concepts and models presented in the book have come about through the authors’ real life experiences in live kaizen events as well as their extensive academic research in the subject area. "In this book, the authors add a great deal of experiential insight into a subject that should be attracting much more attention—the merging of Lean process improvement with environmental process improvement. … A strength of this book is that it characterizes failed and mediocre projects as well as the kind that proponents like to toot." 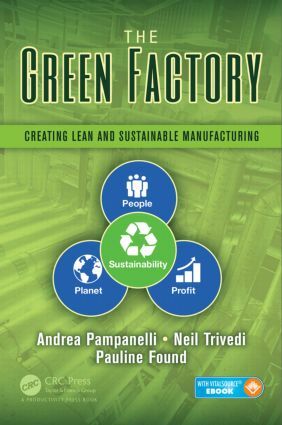 "The book extends the ‘adjacent possible’ of Lean and Green to develop the Lean and Green Business Model, taking as it does the best from ‘planet, people, and profit’ and showing the application at cell, factory, and ‘extended product’ areas. Of particular importance is the eminently practical guidance material on how to do kaizen activities in such areas. Extending the already great value of the book, the authors have gone further to include key implementation lessons, and an extremely valuable section on preconditions for success." "A very useful hands-on, ground-up methodology for addressing Lean and Green issues in your operations. Well worth doing." Dr. Andrea Pampanelli has more than 15 years of environmental and 5 years of Lean experience working for GKN Driveline. During her career in GKN, Dr. Pampanelli developed more than 100 EHS & Lean research projects applied to GKN in partnership with Brazilian local universities and won more than 15 excellence awards from GKN Driveline, GKN Group, and OEM customers. She has a bachelor’s degree in chemical engineering, an MBA in environmental management, a master’s degree in production engineering from UFRGS in Brazil, and a specialization degree in safety engineering by Unisinos in Brazil. Neil Trivedi is a highly experienced strategy and transformation consultant and qualified Lean expert, with broad experience across global platforms within the automotive, aerospace, food, FMCG, transportation, biomedical, and public sectors. He has been instrumental in helping organizations improve their performance by collaboratively tackling complex business problems and in designing and implementing solutions that demonstrate tangible benefits to businesses. Dr. Pauline Found is a course director for MSc in continuous improvement in public services and a senior lecturer in Lean operations at the University of Buckingham. She was previously senior research fellow of the Lean Enterprise Research Centre (LERC) at Cardiff University, where she worked for nine years and was involved in a range of research, knowledge transfer, and engagement and executive education projects and initiatives, as well as writing books and papers on Lean. She is coauthor of Staying Lean: Thriving Not Just Surviving, for which she holds a Shingo Research and Professional Publication Prize (2009).